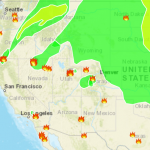 This year the story so far is wildfires in western states and high temperatures in northern states. 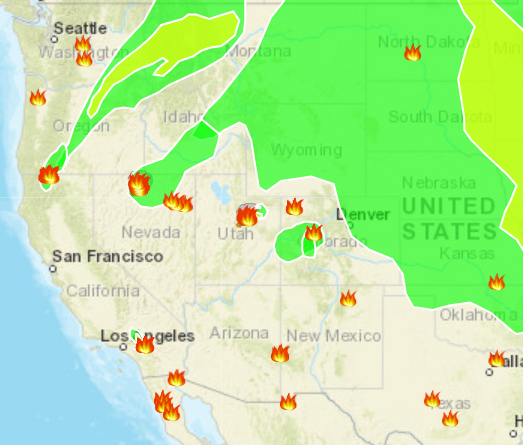 There’s several large wildfires burning in Washington, Oregon, California, Idaho, Nevada, Utah, Arizona, and Colorado. Over the July 4th holiday (it fell on Wednesday) temperatures topped 100° F as far north as Minnesota. It’s now the second week of July, and we’ve only had one subtropical storm, Alberto. Another storm, Hurricane Beryl, is located about 720 miles east of the Lesser Antilles. It was a category 1 hurricane, but it was downgraded this morning to a tropical storm. Last year we had 4 tropical storms by July 4th; first hurricane, Franklin, formed August 9 and hit Mexico the next day. On Monday another storm formed, Tropical Storm Chris (it’s that circle east of the Carolina’s). It’s expected to make hurricane 1 strength by Tuesday but it is not expected to last long or make problems for people. I’m sure there’s more storms coming, but for now it’s all quiet – and hot. 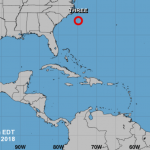 As expected, TS Chris became Hurricane Chris on Tuesday, July 10, but it is expected to head into the Atlantic and not make landfall. There is a high pressure area on the east coast that is keeping it offshore. TS Beryl continued to to slowdown and weaken until today it’s no longer a tropical storm; maximum winds 35 mph. Hurricane Chris strengthened to category 2 overnight. It’s continuing on a northeasterly track, and it’s not a direct threat to land. Today, Tropical Storm Debby formed out in the middle of the Atlantic. It’s not expected to make landfall. Hurricane Hector is threatening the Big Island of Hawaii with Tropical Storm force winds. Near the eye, maximum sustained wind speed is 125 mph. Today, the Nation Hurricane Center said that Hurricane Hector is no longer a threat to Hawaii. Also, TS Debby is dissipating to a depression. And just as I thought, CNN reported today that NOAA predicts a “below normal” hurricane season thanks to El Niño. Two days ago, TS Ernesto formed in the middle of the Atlantic. Today the storm is nearing Ireland. Hurricane Lane, another Pacific hurricane, continues to strengthen and may come close to Hawaii like Hector did. 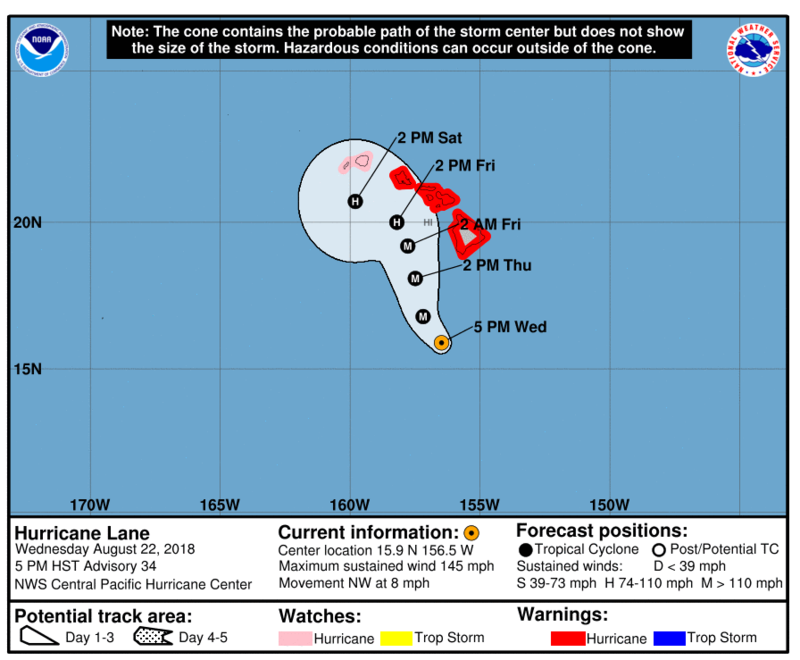 Reports from the Central Pacific Hurricane Center say Hurricane Lane is a strong category 4 (wind speeds of 145 MPH) and could pass dangerously close to the Hawaiian Islands. It appears to be strong and slow moving – the worst combination for populated areas. 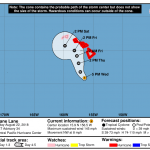 After dumping up to 40 inches of rain on parts of Hawaii, Hurricane Lane was downgraded to a tropical storm today. 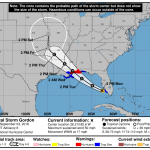 Today, Tropical Storm Gordon formed off of the southwest coast of Florida – about 10 miles west of Key Largo. 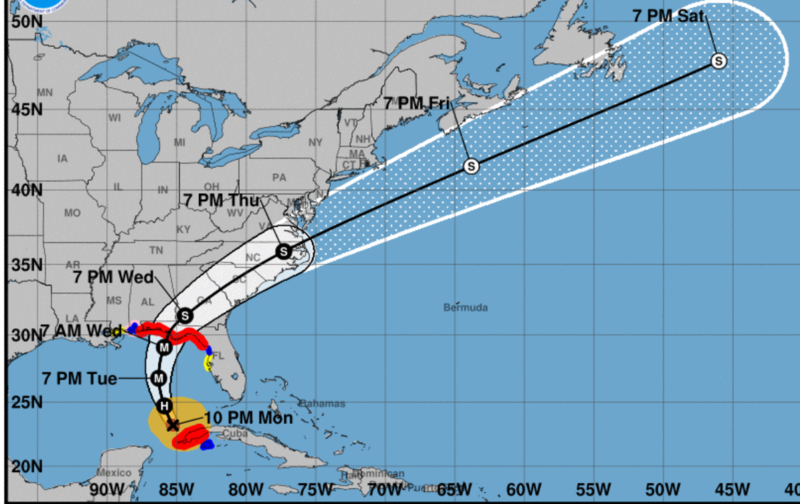 Gordon is predicted to strengthen to a hurricane and make landfall along the Mississippi coast Wednesday (9/5). 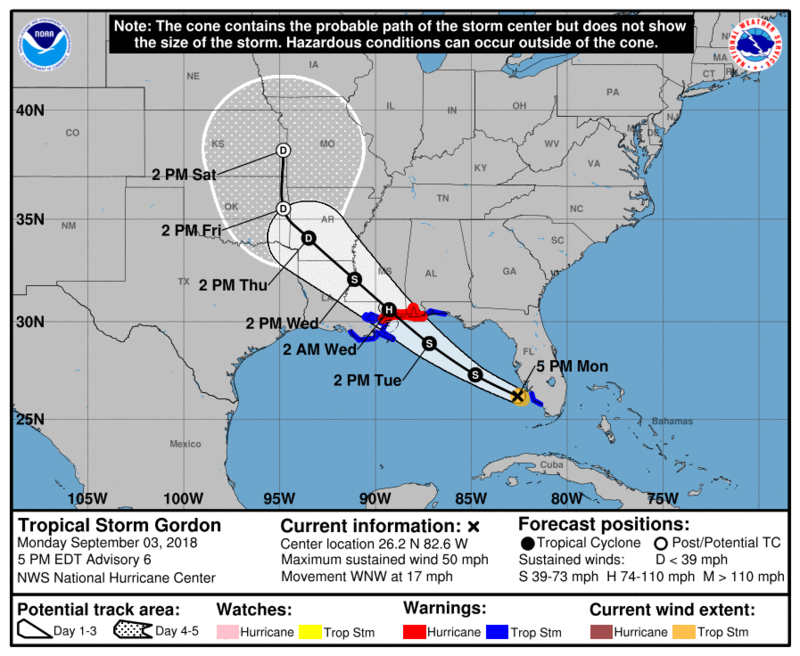 National Weather Service Doppler radar indicates that Gordon made landfall around 1015 PM CDT (0315 UTC) just west of the Alabama-Mississippi border with estimated maximum sustained winds of 70 mph (110 km/h). 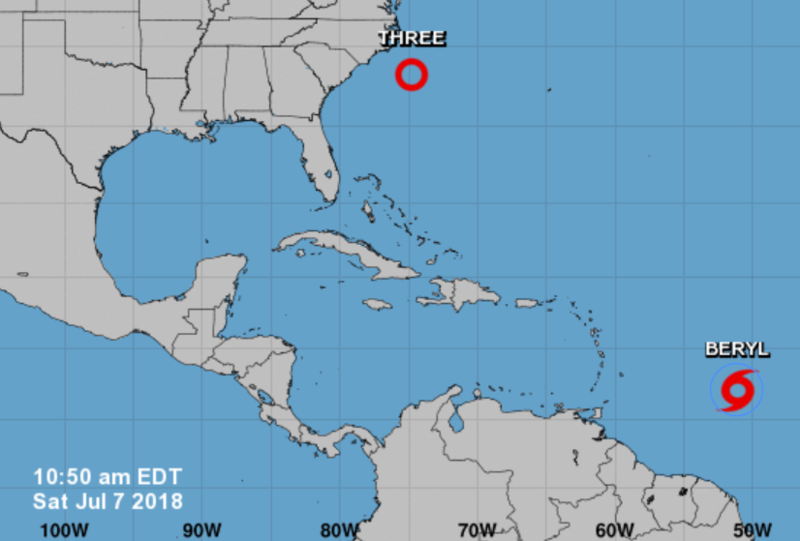 Meanwhile, yesterday about 4:00 AM CDT, Tropical Storm Florence strengthened to a Hurricane Florence in the middle of the Atlantic. 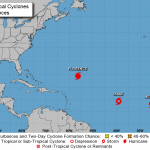 Two new storms formed after Gordon blew through and after Florence started cranking it up – Tropical Storm Helene and Tropical Storm Isaac formed off the coast of Africa. Helene is expected to turn north into the Atlantic, but Isaac is headed toward the Lesser Antilles. Since Wednesday, Florence weakened and then strengthened back into a hurricane. It is now predicted to make landfall on the coast of North Carolina as a category 3 storm. A new potential storm, Invest 95-L, has developed off of the Yucatan Peninsula. The NHC gives the system a 60% chance to develop into a tropical depression between now and Friday (9/14) evening. Near Hawaii, Tropical Storm Olivia weakened from a hurricane and is expected to make landfall on Maui on Wednesday (9/12). Hurricane Florence is now category 4 and is expected to make landfall on Friday (9/14) along the Carolina’s. According to the NHC, Hurricane Isaac will lose some steam and be a tropical storm as it moves into the Caribbean Sea by the weekend (9/15). Hurricane Helene is still in the open Atlantic and may move toward England or France. Hurricane Florence made landfall this morning near Wrightsville Beach, North Carolina, as a Category 1 hurricane with maximum sustained winds of 90 mph. Helene weakened to a Tropical Storm yesterday. Isaac is a depression south of Puerto Rico. 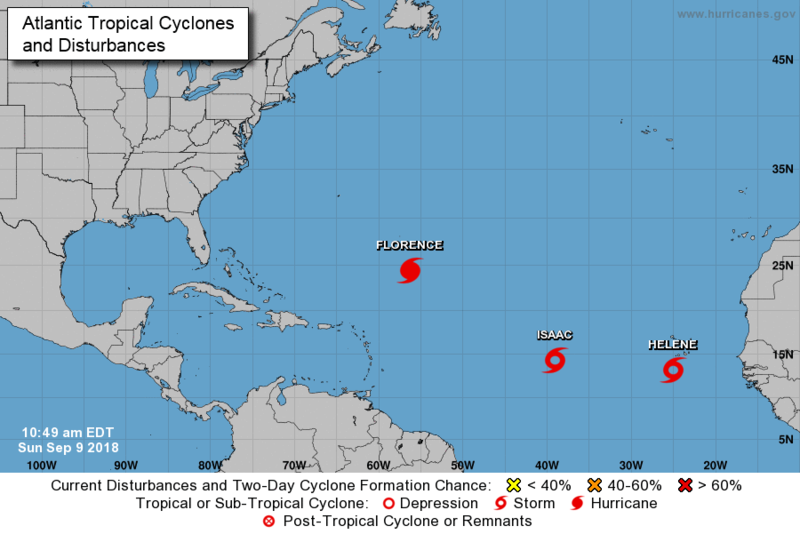 Tropical Storm Joyce formed in the Atlantic near Helene – there’s no threat to land. Invest 95-L weakened and may be a rain maker for the Texas coast this weekend. Hurricane Sergio formed in the southeastern Pacific this evening. It is not expected to make landfall. Hurricane Leslie formed in the middle of the Atlantic this morning. It is not expected to make landfall. Hurricane Michael formed off of the western tip of Cuba today. 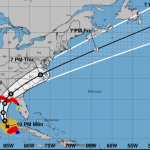 It is expected to move north and make landfall near Panama City, Florida, sometime on Wednesday (10/10). Hurricane Michael strengthened to a category 4 storm with maximum sustained winds of 155 m.p.h (157 is category 5) before it slammed into the Florida Panhandle near Panama City Beach. This entry was posted in Nature and tagged hurricanes, nhc, storms by Chris Siems. Bookmark the permalink.